Iron Street Rope Splicing is the company responsible for the majority of the top-quality spliced ropes, cord, and webbing products sold at WesSpur since its creation in 2009. Iron Street is a fully-capable splicing operation which can handle any hand or machine splicing, on any of the spliceable products we sell. If you have a custom item you would like made, Iron street will splice it for you with speed and precision. From something as simple as a longer or shorter sling or prusik, or a different-sized eye on your climbing line, to a custom false crotch, anchor sling, or spliced product of your own design, Iron Street Rope Splicing will get it done. Call or email WesSpur with your specifications on your next order, and your spliced products will be made to order by professional splicers. 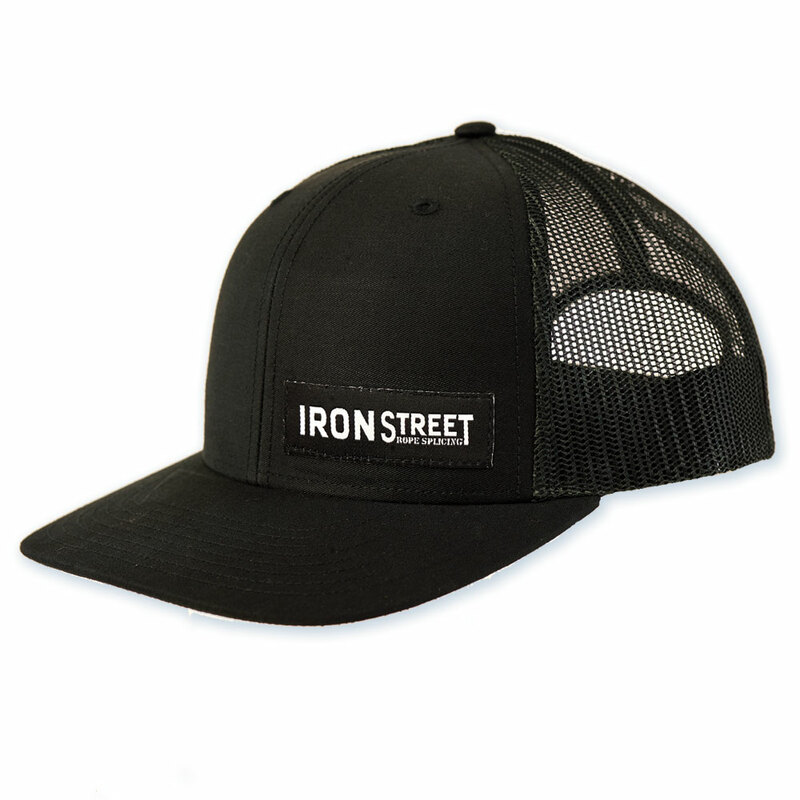 Mesh-back black cap with Iron Street Rope Splicing logo sewn on. Note: See individual rope descriptions or the WesSpur catalog for valid splices on any given rope. Instructions which indicate an invalid splice for a given rope, missing, or unclear instructions may cause a delay in shipping your order. Most splices will be completed within 1-2 business days from time of order. This splice is only available on Pro-Master 3-strand rope, of any diameter. Note: Instructions which indicate an invalid splice for a given rope, missing, or unclear instructions may cause a delay in shipping your order. Most splices will be completed within 1-2 business days from time of order. This splice is only available on Tree-Master 3-strand rope. Nylon chafe sleeve for the protection of arborist ropes and slings. You may order chafe sleeve by the foot here for your own spliced products, or request it on any spliced product we make that will fit the sleeve. Often used to reinforce spliced eyes or as a movable chafe sleeve on fliplines, winch lines, etc. “I have been using high quality spliced products from a local vendor here in Bellingham, WA for several years now. In the fall of 2009 we decided to start a splicing company. In December we built our first production splicing table, got the Bar-tacker machine ordered, and Iron Street Rope was born. “Now there are 4 highly-skilled splicers on staff, and a computer-controlled bar-tacking machine turning out hundreds of products a week. Everything from stock ropes and slings, to friction savers, lanyards, prusiks. The splicers at Iron Street made it thru a selection process that was intensive in training and all the employees take pride in providing quality equipment for those of us who work at height. Integrity and attention to detail are the foundation of the staff, so you are assured of the highest-quality work in your spliced products. The splicers at Iron Street can do Class-1 and Class-2 double braid and 12-strand. 16-strand, 3-strand, and 8 strand splices, and the bar-tacking machine can handle any sewable rope or webbing. Splicing is done for the arborist, marine, stage rigging, and industrial markets. “Iron Street also do custom splicing. Want a lanyard in your favorite rope? Just ask. Need different length slings? No problem. Iron Street has a 105,000 pound load test bed so they can regularly test splices to insure specs are met and it aids in the development of new products. Need your spliced products break-tested just send them in. Remember if you don't see the exact item you want in the WesSpur store, then call and get a custom item made.